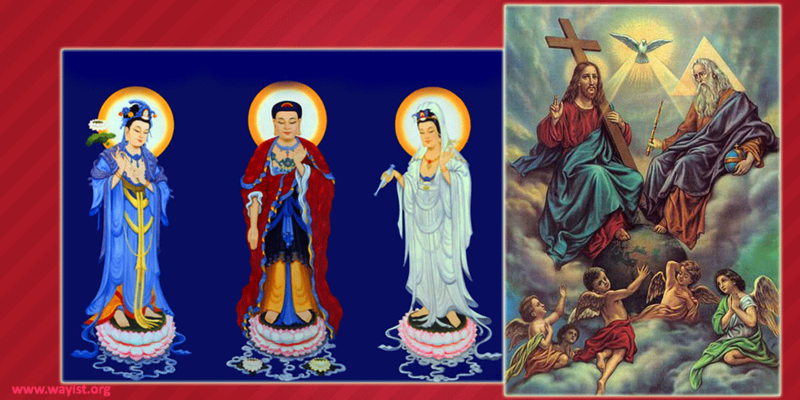 Images of the Trinity of Sukhavati were displayed, and worshiped in the East, early in the 2nd century. The Wayist doctrine of the Trinity was simple, just as Iesous told about the three principal senior spiritual beings taking an interest in the evolution of our souls, and our enlightenment — the God the Father, Avalokiteshvara and Mahasthamaprapta. below from Devotional Wayism site. Christianity adapted their understanding of the Trinity; the most significant departure being the Father of Heaven is equated with the Omnipresent, Omnipotent Creator, and Iesous is equated with the Word, the Om—the Way itself.